TICKETS ARE SELLING EXTREMELY FAST - BUY TICKETS NOW BEFORE THEY SELL OUT! Tickets Now On Sale - see you & your friends there! Be sure to "Like" & "Share" above to help spread the word!! Includes dozens of wine & cocktail samples in your custom sampling glass! SEE BELOW for everything included. General Admission at a discounted rate when you purchase 6 or more tickets together. Includes dozens of wine & cocktail samples in your custom sampling glass PLUS an hour early entry to beat the rush, extra VIP-Only Wines & Cocktails, and get first shot to sample the best products! SEE BELOW for everything included. Includes everything with regular VIP Admission tickets, just at a great discounted rate when you buy 6 or more tickets together! Includes everything with VIP Tickets PLUS access to the high rollers Ultra VIP tables for 10 extra samples of the very best super-premium & top-shelf liquors & wines!! LIMITED TO 50 TICKETS ONLY! Ultra-VIP Admission at a discounted rate when you buy 6 or more tickets together. 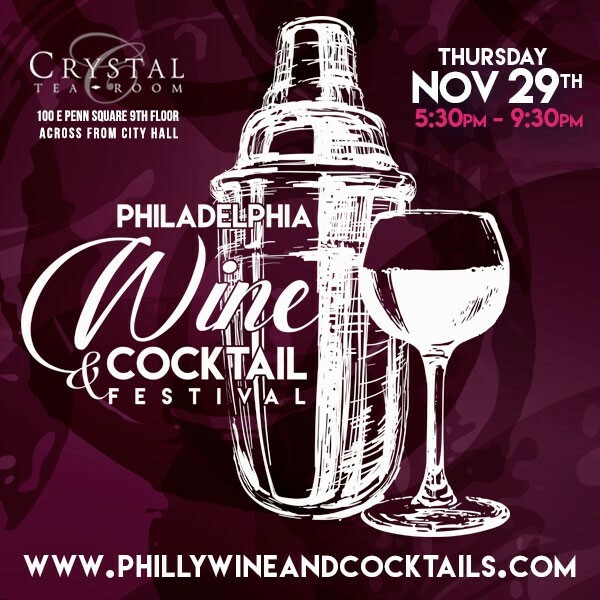 Join us for The Philadelphia Wine & Cocktail Festival on Thursday, November 29th at The Crystal Tea Room! The event will commence with an Exclusive VIP Hour from 5:30pm to 6:30pm and at 6:30pm, General Admission Ticket Holders may enter. FULL PARTICPATING VENDOR LIST CAN BE FOUND AT THE LINK ABOVE!!! Philadelphia's Premier Wine and Liquor / Cocktail Tasting Showcase Will Feature Tastings From Over 80 Varieties of Wine From Local Wineries, Tequilas, Whiskeys, Bourbons, Vodkas, and More! Enjoy Cheese Samples From several Cheeseries along with multiple local restaurants sampling their delicious light food. Live Acoustic Music & DJ entertainment. Many wines sampled will be available for purchase by the bottle to take home. All Guests Will Receive a Complimentary Commemorative Sampling Glass Upon Entry. 3-hours of dozens of local, national, and international wines, tequilas, whiskeys, bourbons, vodkas, and more. Sample food from multiple local restaurants. ... plus everything with General Admission tickets! Access to the Ultra VIP tasting tables with 10 tickets to sample super-premium products. Think the "Top Shelf" at you favorite location! Limited to 50 tickets only!! ... plus everything with VIP Admission tickets!